Material Design started in 2014 and it was introduced by Google to provide a consistent look and feel across browsers. It combines animation effects with soothing colors, shadows, aptly measured margins/padding etc to improve the User experience. Back in the era of Flash/Flex, components designed using Flex has a visual appearance which felt natural. Without any need of adding styles, the plain Flex User Interface felt good. HTML components were lacking such natural appearance. Maintaining consistency across the browser was always a pain. With Material Design the UI aesthetics and interaction has improved dramatically. Though Angular CLI enables you to quickly get started with creating a new project, it doesn’t come bundled with the Material design. Additional steps are required to integrate the Material Design and apply the styling to the components. In this article, we will learn the steps to integrate Material Design in Angular 6. We will extend this article and build following UI to understand some of the Material Design Components. You should see a welcome message with Angular logo. 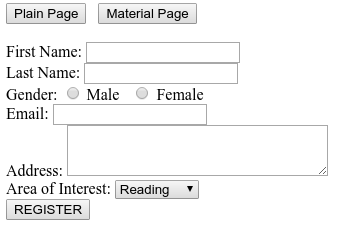 We have used default HTML controls to design our form. For demonstration purpose, we have used various controls like text input, radio, text area, select and button. To populate the select options, open plain.component.ts file and replace it with following code. The page we have just created will not be visible immediately. Also, we will not directly embed it in the main application module. Instead of that, we will use a router to load the page. 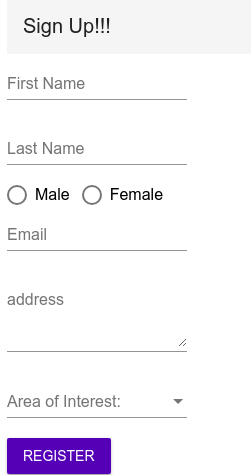 This will give us the option to switch between default HTML page and one designed with Material Design. The route definition needs to be registered and the router module should be imported to make it available for the components. Modify the src\app\app.module.ts with following contents. The page looks pretty simple and has no formatting at all. We will change the look and feel of the page using Material Design. Select and Option has been replaced with <mat-select> and <mat-option>. Button tag has an additional attibute mat-raised-button. In above code we have imported MatButtonModule, MatFormFieldModule, MatInputModule, MatRadioModule, MatSelectModule, MatToolbarModule from @angular\material. Same has been specified in imports property for @NgModule. BrowserAnimationsModule has been imported to enable animation for Material components. Angular provides an option to disable animation using NoopAnimationsModule. Constant appRoutes has been extended to include path for the new material component. Now its time to include material specific style. Open src\styles.css file and add the following line to it. The material design comes with various prebuilt themes to choose from. If ng serve command is running, refresh the browser and you should have following output for the Material page. Congratulations!!! we have successfully integrated material design with Angular. What we have explored is just a few basic options of material design. 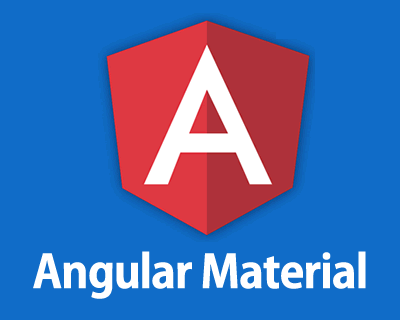 If you are interested in exploring more capabilities of Material and other components visit Official Angular Material website.